Graded PR 1 by PSA. E94 candy card featuring the legendary Honus Wagner in a batting pose set against a gold background (one of the seven different background color variations of the set). 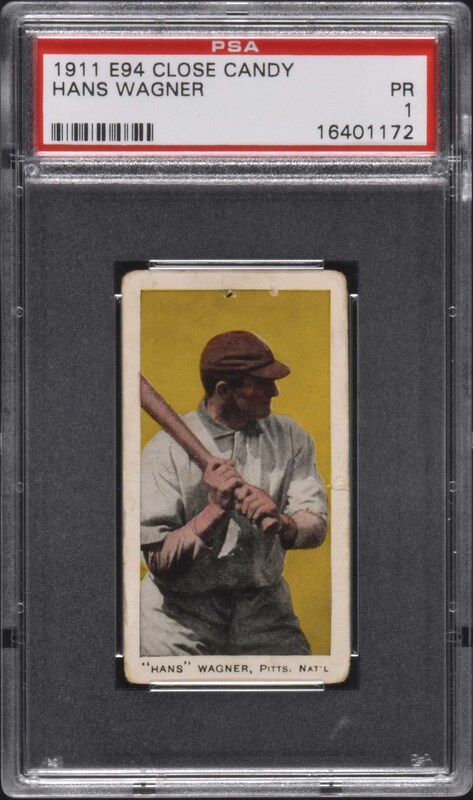 The E94 Wagner is considered by many to be among Wagner's most classic cards. This is a very attractive low-grade card with bright, crisp colors, clean front and back, evenly rounded corners, outstanding centering, and flawless registration. The back is also bright and clean, with bold text. Downgraded due to staple holes at the top. While at a glance E94s may be easily confused with other caramel-card sets of the era (E93 and E98 specifically), they are an entirely different set, even though they use many of the same subjects and poses. Of the three previously mentioned sets, E94s are the most difficult to find. The E94 caramel-card set is usually associated with the George Close Co. of Cambridge, Massachusetts. While most of the E94 cards do not have any sort of advertisement on the back, some have been found with overprints that refer to this company. Caramel cards, of course, are rarely found in high grade. 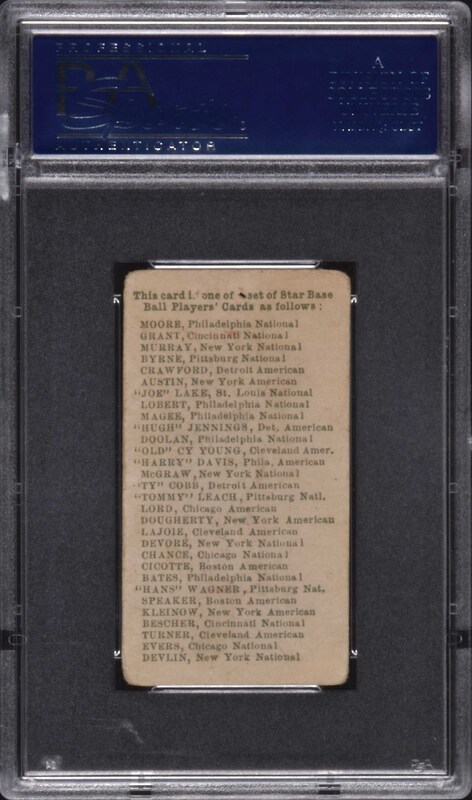 This is an extremely attractive low-grade example of one of Honus Wagner's most classic cards. Reserve $300. Estimate (open).